How has a Career in Local Government been Rewarding? I've spent approximately half of my post university years working in municipal government. This was a career that first caught my eye while auditing a couple of small towns here in the Annapolis Valley. Not only has municipal finance & administration given me a chance to stay in Nova Scotia, it has allowed me to contribute to a sector whose goal it is to enhance the lives of residents at the local level. Municipal government covers such a diverse collection of public services that I have increased my professional and administrative knowledge far beyond my chosen profession of financial accounting. Unlike some private sector businesses that can be focused on one industry, municipal government covers everything! Evironmental sustainability (examples: active transportation corridors, rail trail development), to neighbourhood planning, to basic services such as water utilities, electric utilities, roads and streets. Municipal finance is involved with all these services, and I've had the chance to work with talented co-workers in all these fields. Municipal government has allowed me to make a difference at the local level in areas such as improved low income tax exemptions, and on a provincial level through participation in committees with individuals from across the Province. 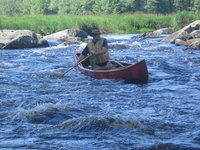 So for me, the rewards have been the ability to positively impact residents at the local level, help inform provincial policies, expand my knowledge base beyond simply finance...and at the end of the day, be able to live in the Annapolis Valley while pursuing my non-work hobbies, which include endless canoe routes. "The rewards have been the ability to positively impact residents.."